Over recent years North Swindon residents have been keeping their eyes on large swathes of development land close to their homes in Oakhurst and Redhouse because, at some point, the owner of the land, (Crest Nicholson), would wish to develop it and realise some return on their investment. That time arrived recently, and on the 12th of June 2012, 15 members, (8 Tories, 6 Labour & 1 Lib Dumb), of the planning committee at Swindon Borough Council unanimously gave the thumbs up to Crest Nicholsons plans to develop the land they own at Tadpole Farm, which lies just the other side of Tadpole Lane from the Oakhurst and Redhouse estates. Residents have been expressing their concerns about these plans for a long time and it wouldn’t be unfair to describe the plans as ‘controversial’. Members of the Talkswindon.org forum have been discussing proposals to develop Tadpole, Ridgeway & Pry Farms for quite a while and the Oakhurst Residents Association, (ORA), maintain a very informative blog which discusses in detail Crest Nicholsons plans to build nearly 1,700 homes at Tadpole Farm despite unresolved concerns about the lack of school places, vehicular congestion, increased risk of flooding, lack of local infrastructure, insufficient capacity in the water supply and sewerage removal. So far, so good and I expect readers will be thinking that this all looks fairly normal and ‘business as usual’ and that developers, residents and local Council have engaged in the usual three-way dance of development, planning permission has been granted and, after a short period, the dust will settle and everything will get back to normal. If this were a normal situation I would agree with you, but this is anything but a normal situation because the issue of ‘Inappropriate Development’ was deliberately manipulated, whipped up and politicised in the run-up to the 2012 local elections by several young and inexperienced Conservative candidates, one of whom, on being elected, found himself ‘serving’, (that’s a dubious description IMHBVO), on the planning committee at Swindon Borough Council and having to vote on whether to approve or reject the very same development proposals that he and his colleague, Cllr Faramarzi, had already pledged to fight and oppose in election leaflets they had recently stuffed through the letterboxes of residents in Priory Vale, Oakhurst and Redhouse. “Saturday campaigning: Tadpole Lane – On Saturday myself and Councillor Emma Faramarzi joined Paul Exell and Kevin Lay from the Oakhurst Residents’ Association to collect signatures for a standard objection letter relating to Tadpole Farm”. During the first round of public consultation, the council received 470 letters of objection or concern, and just nine in support of the plans for Tadpole Farm. It is easy to see why Cllrs Elliot & Faramarzi would want to jump on that particular bandwagon and ingratiate themselves with a concerned community. It turns out however, that Toby and Emma spent just 90 minutes with Oakhurst residents who were collecting objections to the Tadpole Farm application. 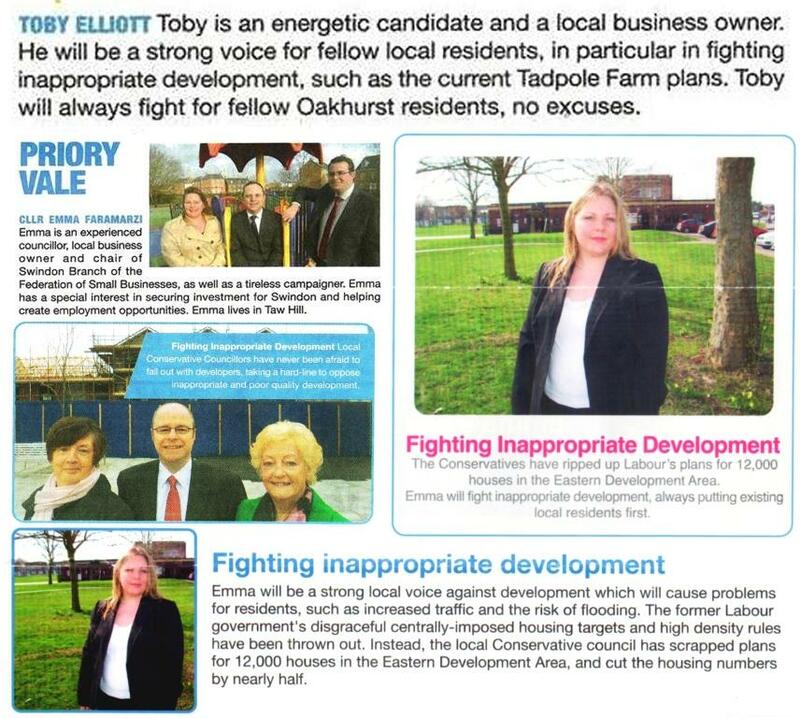 Only much later did Oakhurst residents learn that Toby & Emma considered their involvement and physical presence to be part of their Conservative election campaigns although in fairness to Cllr Faramarzi I should point out that her pledge to ‘Oppose inappropriate development’ has been present in each of her election campaigns – not that longevity should be mistaken for credibility in this case. 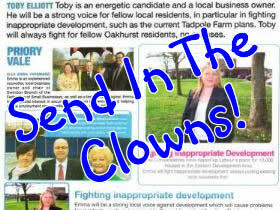 From now on, I expect that wherever and whenever Cllr’s Faramarzi and Elliot turn up at community meetings, actions and other events it would be only natural that residents view their presence with a certain degree of suspicion, especially so, because at the very first test of their joint election pledges, one of them abandoned their pledge to ‘Fight Inappropriate Development such as the Tadpole Farm Plans’ faster than a Liberal Democrat running away from the ‘No Tuition Fees’ pledge and the other has remained stonily silent on Cllr Elliot s decision to nod through, instead of ‘fighting or opposing’, the plans for Tadpole Farm which both of them considered to be ‘inappropriate’ whilst they were seeking votes from North Swindon residents. When a politician feels the need to issue multiple statements, each justifying his past behaviour within a council committee, he or she is acknowledging that they have failed in some, if not all, aspects of their performance during that committee. When a member of a planning committee is discussing on his Facebook Page his apparently fettered opinions and pre-determined voting intentions for a planning meeting that has not yet happened, that member has demonstrated why he should not be on that committee in the first place. Incidentally, while I’m on the subject of Cllr Elliots Facebook page, I note that two recent retiree’s from Swindon politics have been lured, like the pair of Bluh’s Bottles they are, by the smell wafting downwind from the windmill which has recently taken delivery of a large amount of shite. Yes, David Glaholm and Andy Harrison have turned up to another battle of wits and, as usual, both of them have arrived unarmed. David Glaholm: “Get Labour group to support this approach?? Priory Vale Conservatives: “Sorry David, which approach were you referring? I believed that all groups supported this as the vote was unanimous on the day”. I won’t bother offering to help Andy get a grip on his grammar, but I do wish he would at least try to get a grip on his unhealthy obsession with me. I don’t think I can do much to help him tell the difference between reality and fantasy but one suggestion would be to remove his head from between the rosy red cheeks of Rod Bluh’s arse. What you are seeing from that vantage Andy is not the truth and it is definitely not sunshine. Cllrs Faramarzi and Elliot have already tarred themselves with the brush of hypocrisy and few people will trust their word absolutely or have much faith that either really means what they say. The presence of Mssr’s Glaholm and Harrison will do nothing to improve their current position because it’s common knowledge that both are relentlessly pursuing their own agenda’s and vendettas against individuals and organisations they think have ‘slighted’ them, and will jump on any convenient bandwagon from which to fire a few shots off. Both are classicly bitter men who are toxic to everything they come into contact with politically. To get too involved with either is to become surrounded by the particular miasma which follows both of them and it’s why both have many more Facebook friends than actual ones in the real world. The whole political atmosphere surrounding the Tadpole Farm decision is beginning to feel like Rod Bluh has dressed his committee members in clown suits, complete with huge, flappy clown shoes and then ordered them to play football in a heavily mined field. It promises to be spectacular, painful, inconvenient and expensive for all of us. In a couple of days I’ll pen a few more words about about Cllr Elliots consultative sham and what I think are the real reasons for this ‘inappropriate development’ suddenly becoming very appropriate from the Tory Councillors points of view.